As with other precision lab instruments, periodic re-certification is recommended to ensure the continued conformance and accuracy of working test sieve. 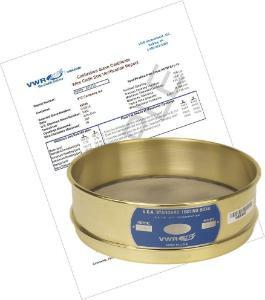 Because accuracy and precision are vital components of any Quality Control Program, VWR® Pre-Certified Sieves ensure compliance with the American Standards Testing Materials (ASTM) E11 specifications. VWR® Pre-Certified Sieves employ sophisticated software and optical technology that scans for irregularities and takes physical measurements in a midpoint orientation of the wire in the “X” and “Y” directions (warp and weft). The data gathered is summarized in a comprehensive verification report that is linked to each serialized sieve and evaluates exactly where the sieve lies in relation to the ASTM E11 standards. Verification reports identify a trace number that measurements taken are traceable to the National Institute of Standards and Technology (NIST). The current ASTM E11 standard offers two available grades of pre-certified sieves (inspection or calibration). Inspection Grade sieves are supplied with a Sieve Inspection Certificate containing inspection data that has a percentage of openings and wire dimension measured based on the ASTM E11 standards table providing a confidence level of 99.0% that each sieve is within the specifications. Calibration Grade sieves are supplied with a Sieve Calibration Certificate containing data of at least twice as many apertures measured than inspection sieves, thereby providing the highest confidence level available of 99.73%. Certifications: ASTM E11 Calibration certified. Ordering information: Serialized Sieves come with Calibration Certification Report.